Seti’s Polish Boys – Cleveland, OH – Michael Symon’s Favorite! – Food Truck Talk – Searching for the best foodtrucks! Seti’s Polish Boys – Cleveland, OH – Michael Symon’s Favorite! With food trucks serving huge varieties of ethnic foods and gourmet fare it’s not unusual to sometimes overlook local food trucks who have been serving out native food to their local communities for years before the food truck phenomenan hit. 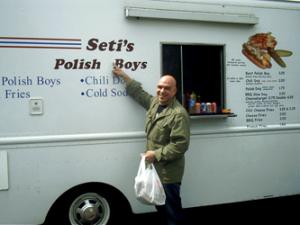 In Cleveland such a food truck is Seti’s Polish Boys. For the last ten years Seti and his wife have been serving up a sandwich invented in Cleveland – The Polish Boy. A Polish Boy is a Kielbasa sausage placed on a bun and covered with french fries, barbecue or hot sauce and cole slaw. 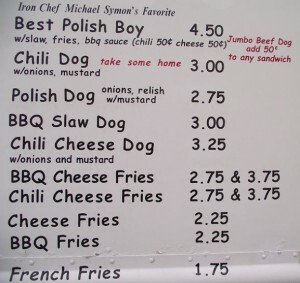 Iron Chef and Clevelander Michael Symon citied the Polish Boy as the “Best Thing I Ever Ate” on the Food Network when he featured the Polish Boy from Seti’s. Iron Chef Michael Symon getting a bag of Polish Boys to go! The Seti Polish Boy starts with the sausage being slow grilled. Then once you place your order it is then quickly deep fried before being added to the bun with hand cut french fries, their homemade bbq sauce and cole slaw. Although not totally traditional Seti’s offers chili and cheese as options to your Polish Boy. Seti’s also serves jumbo beef hot dogs (prepared in the Polish Boy style if desired), Polish Dogs (onions, relish and mustard), BBQ Slaw Dog, Chili Cheese Dog and hand cut fries available with chili, BBQ sauce and cheese, or bbq sauce as toppings. I wouldn’t be at all suprised if other food truck operators come to Cleveland to try a Seti’s Polish Boy and try to replicate the concept in their city! Philadelphia Cheesesteaks, Chicago Italian Beefs, and Cleveland Polish Boys – great sandwiches wherever you are!